Golbez, real name Theodor (セオドール, Seodōru? ), called Man in Black (黒衣の男, Kokui no Otoko?) before his identity is revealed in The After Years, is a non-player character in Final Fantasy IV and a playable character in Final Fantasy IV: The After Years. In Final Fantasy IV, he is the main antagonist, a powerful sorcerer who pursues the Crystals. In The After Years, Golbez returns as a playable character. Golbez has also appeared as a playable character in the fighting games, Dissidia Final Fantasy and Dissidia 012 Final Fantasy, as the villain opposing Cecil. In Final Fantasy IV, Golbez is voiced by Peter Beckman under the pseudonym Anthony Landor. Beckman returned to voice Golbez using his actual name in Dissidia and Dissidia 012. In the Japanese versions of all three games, he is voiced by Takeshi Kaga, famous for his role as the Chairman on the television program Iron Chef. Golbez’s appearance in Final Fantasy IV is that of a tall imposing man in dark blue and black armor with gold trimmings, and a helmet with tall horns. The lining of his cape has been both red and blue in color, sometimes in the same game – the Nintendo DS release shows Golbez’s official render with a blue lining, but his in-game appearance has a red lining. The exact color of his armor has also varied considerably between appearances, from light blue to dark blue to black. 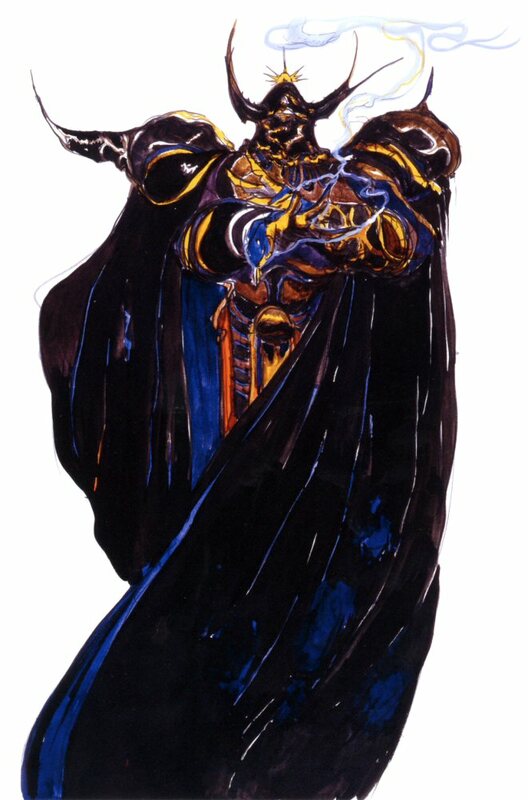 In The After Years, Golbez wears a black cloak and kilt with rings of prayer beads on his arm. He has a large, muscular figure and long silver-white hair like Cecil. His concept art depicts him wearing a large black sword on his back, possibly the Ebony Blade, an exclusive weapon for Golbez that can be acquired at the start of his tale. His armored sprites and SD art depicts Golbez with green eyes, while his PSP portrait in The Complete Collection gives him blue eyes. In both his Complete Collection sprite for The After Years and his appearance as a child in the DS release of Final Fantasy IV, Golbez has violet eyes like Cecil. Through the majority of Final Fantasy IV, Golbez appears as a cruel and heartless man who will stop at nothing until he has obtained the Crystals, destroying anyone and anything that stands in his way. He is also a cunning manipulator, tricking Cecil and his allies into retrieving two Crystals for him, and otherwise luring them into traps. As Fusoya later reveals, Golbez is being manipulated by a powerful Lunarian named Zemus by bonding Golbez’s thoughts with his. Awakened, Golbez’s personality shifts radically back to his true self; Golbez is horrified by his actions and feelings of hatred. Golbez’s true personality is that of a caring, self-sacrificing, and deeply empathetic individual. During The After Years, Golbez is stoic and silent. His focus is investigating the Mysterious Girl’s actions and gaining entry to Baron to make sure Cecil is safe, and he only speaks on matters relevant to these goals. However, he occasionally demonstrates a dry, somewhat sardonic wit. While the other party members openly express their reactions to the bosses on the True Moon, Golbez keeps his thoughts on such to himself, and shows compassion and sympathy towards the Archfiends, wishing them peaceful rest when they are slain. When confronting the Dark Knight, he accuses Golbez of wanting to die at Cecil’s hands to atone for both his actions under Zemus and abandoning Cecil as a child – Golbez neither confirms or denies this. If he survives, he later tells Cecil he can no longer hide from the world, and must live up to his crimes. The Dissidia series somewhat merges these two aspects of Golbez’s personality. Golbez truly wishes for Cecil and the other Warriors of Cosmos to prevail, and he appears to Cecil and the other heroes numerous times to offer assistance at his own risk, as the other villains view his behavior as treachery. Golbez manipulates the heroes towards the ultimate goal of their victory, in particular, placing the Wild Rose for Firion to find in order to inspire his dream. Golbez also has no qualms about attacking the heroes when called upon, including Cecil, but has good reason for this. His Dissidia 012 museum profile states he was content to remain in the cycles of war as punishment for his sins, but Cecil’s appearance, and the sacrifice of six of Cosmos’s warriors at the end of the twelfth cycle, motivated him to help Cosmos end the cycles and free Cecil and the remaining Warriors.